The BBC News web site carried an article last week about the tragic death of a British soldier in Afghanistan. What made this story different from the depressingly constant stream of similar reports was that his death was caused by a data error. He was killed by a smoke shell fired from a British artillery weapon which fell short of its target due to an error in the data used to compensate for the effects of weather conditions on the shell’s flight. The computer system which would normally provide this data automatically was not working so the gunners had to input the data manually. Unfortunately, they used the wrong data, with tragic consequences. Ironically, one of the driving forces behind the development of electronic computers was the need for accurate artillery firing tables. In the days before fully computerised fire control systems, these tables provided the settings that gunners require to compensate for the effects of external factors (such as wind speed and direction, air temperature and the rotation of the Earth) on the trajectory of an artillery shell. However, the preparation of such tables was very labour intensive, with a single trajectory taking two full working days to calculate using a mechanical desk calculator, and the increased demand for them during World War II prompted the US Army to fund the development of calculating machinery which could speed up this process. This resulted in the development of the first general-purpose electronic digital calculator, the Electronic Numerical Integrator and Computer (ENIAC). ENIAC was developed at the University of Pennsylvania’s Moore School of Electrical Engineering in Philadelphia. The completed machine weighed over 30 tonnes and its cabinets lined the walls of a room 50 feet long by 30 feet wide. 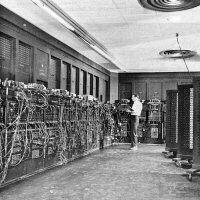 Although ENIAC’s main purpose was to perform calculations for artillery firing tables, it also possessed the flexibility to cope with a wider range of computational problems. The insights which the ENIAC project team gained through providing this extra flexibility led directly to the development of the stored-program computers that we use today. The two men who led the development of ENIAC, John Mauchly and Presper Eckert, went on to create the UNIVAC I, one of the first computers to reach the market. UNIVAC I was designed primarily for business data processing but its origins, and the origins of all stored-program electronic digital computers, can be traced back to the US Army’s need for artillery firing tables during World War II. This entry was posted in Uncategorized and tagged ENIAC on 14/04/2013 by Stephen J Marshall.